Why isn't anyone else on the train? Most urban transit is _crowded._ Could it be because Sacramento's RT is kind of dodgy? That's been my experience. For a woman riding alone at the wrong time, it can be more than a little weird -- if not downright creepy. 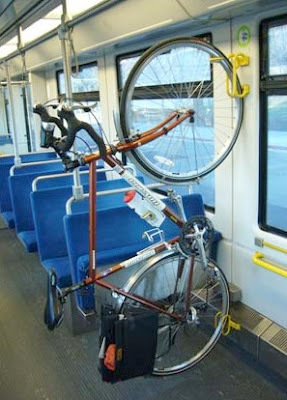 Other light rail systems have this bike storage setup. I know the Hiawatha line in MPLS has it. I think Denver and San Diego have it as well. For Metra, commuter rail in Chicago, 2 bikes are able to be stood normally next to a row of flip up seats. Metra riders should bring bungee cords to attach their bikes to the flipped up seats, lest they want to stand next to the bikes to hold them when the train turns and brakes. Santa Clara/VTA light rail also has a similar setup. It's efficient use of space, but many people don't like having to lift the bike up onto the hook. If and when KC ever gets their light rail system established, I hope they have racks like this, too! All major transit buses out here have a two-bike rack on the front. I use the transit system to make my 60-mile round-trip commute feasible without using my car at all. 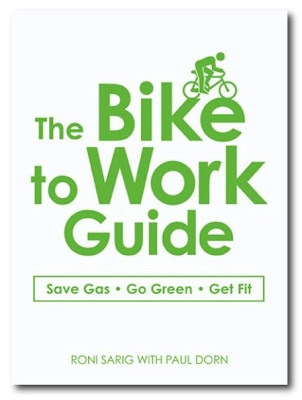 Without these provisions in place, my bike commute would be ominous enough to prevent me from doing it daily. Been a while since I rode Sacramento light rail, but during peak commute times, the trains were very busy. Lived in West Sac for several years and never took RT, but was a regular Yolobus user. One of my biggest pet peeves was that intermodal travel using the bus was always a gamble, because you never knew if both spaces on the bus's bike rack would be full until the bus got there, and if so oftentimes there'd be nowhere convenient and safe to lock up your bike. Grrr!